If you haven’t figured out what to do with the kids… we have the solution. Nothing spells love like a family vacation. The key here is to pick a destination that has something to offer for everyone — it should be action packed and fun filled so the kids are beat by day end, leaving the grown-ups to have their own fun in the evenings. 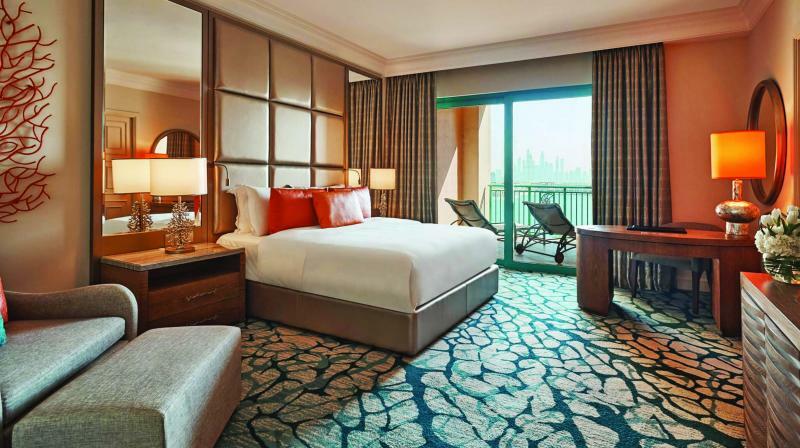 Our pick is the Atlantis The Palm Hotel in Dubai. It has all the ingredients for the makings of a super extended weekend holiday. There’s plenty of adventure for the kids and baby-sitting facilities allowing you to be foot loose and fancy free to spoil your spouse. Relax and unwind at the zero entry pool or play game of volleyball with the kids. It’s also great to just goof around in the water. Let’s be honest, no one is too old for a water park! With all those slides and rides it’s time you unleash your inner child. Visit the Aquaventure Waterpark at the Atlantis and splash around like your sixteen again. The Tower Of Poseidon features record-breaking rides and slides — there’s also the ‘Leap of Faith’, water coasters, the Aquanconda and the Zoomarango. Teenagers will have a blast. For toddlers there’s a splash pool with fun rides and Dolphin Bay where they can interact with these playful marine creatures like seas lions and dolphins. Those who want to relax while the kids’ splash around, there’s the Lazy River. For adults looking for adventure the Lost Chambers Aquarium offers options of a Shark Safari or an Aqua Trek, where one can swim aside 65000 different species. If you like your yoga and meditation, try a session early in the morning surrounded by these wonderful creatures. The Aquarium is also a great place for kids to learn about marine life or send them to the Atlantis Kids Club or the Play Zone, a destination that aims to excite, entertain and inspire young minds. Through games, activities and challenges led by a dedicated team, children are inspired to unleash their imagination to become a pirate, a mad scientist or a champion. Inquisitive minds will be challenged at the Atlantis Kids Club Command Centre, home to the latest technology including Apple Macs, Nintendo Wii, Xbox One and PlayStation. While the kids are busy, couples can soak in the sun at the Imperial Beach, or indulge in luxury treatments in the Spa. Wait there’s more — one can find that perfect Valentine’s Day gift at the Tiffany’s store on the premises. As for accommodation, the newly renovated suites and rooms in the Imperial Club offer both privacy and a home like feel with uninterrupted views of the clear blue ocean. Take in the comforts of the many amenities at ones’ disposal. The Imperial Club rooms feature exclusive benefits like a private check-in and check-out, a dedicated concierge team, breakfast high tea and evening drinks served with delicious canapés at the Imperial Club Lounge and complimentary airport transfers. The suites feature one, two and three bedroom formats giving the kids plenty of space to run around while simultaneously giving privacy to the couple for some quality time together. A fully serviced bar and personal service attendants meet your every whim. Seafire restaurant is the perfect destination to celebrate Valentine’s Day. Indulge your special someone with an exquisite three-course set menu complemented by specially crafted ‘Romeo and Juliet’ cocktails while enjoying the best of swing and jazz tunes live. Family style restaurants include Rona Locatelli, Bread Street Kitchen and bar and Kaleidoscope. There are plenty of specialty options like Ossiano Seafood, Ayamna Lebanese and an Asian buffet at Saffron. Once you tuck the kids into bed you can head out for a chic dinner at Nobu for some Japanese or Chinese at Hakkasan. Trust us, you’re going to thank your lucky stars you’ve got kids; it’s the best of both worlds! If you don’t have the time to getaway then choose a hideaway in the city. There’s nothing better than a staycation; you’re connected while being disconnected. Indulge in the comforts of a luxury hotel or pick a boutique experience in the many small hidden gems in your city. If you have kids then pack them off to the in-laws if you get the chance. Enjoy a romantic dinner in one of the hotel’s niche restaurants or order room service and spend the night indoors. A good bet, one you can’t go wrong with, usually centrally located in most big cities is The Taj group of properties. The Hotels have all there is to offer from luxury suites to deluxe rooms with city views. What’s more — there are plenty of promotions at each property celebrating Valentine’s Day. There are packages that include spa treatments and dinners with breathtaking views, or chose from an array of specialty restaurants which feature tempting promotions. For example The Orient Express restaurant at the Taj palace Hotel in New Delhi is reminiscent of a bygone era, of the traditional grandeur of timeless romance. It offers a classic European five-course degustation menu to the tunes of the resident pianist for a romantic evening. One can then call it a night and escape to the luxury of your suite… lastly nothing of course beats breakfast in bed the morning after. For couples that have been dating for years or married for ages, there are always a few moments that are close to your heart. A cherished memory or a fond thought, that is special. It could be the first time you met, or when you proposed, or when she cooked that first meal for you; something cheeky and naughty that you can’t get off your mind. It could also be a holiday that was off the hook. One of the best dates is a recreation of that memorable moment. Create the perfect setting in the confines of your home — food from that destination you can still taste, statement pieces that add a perfect touch, dress up or down (if you like) to the theme. For instance if you popped the question in Turkey then recreate the atmosphere-order some Lebanese food, a shisha or two, pick up some decorative lanterns and cushions. If you met at a jazz bar, then recreate the ambience of the night-jazz music belting on the gramophone, dress up 60s style… you get the idea. There’s nothing your partner would cherish more than the effort you have made to make him or her feel special.